Covers website, email and social media marketing in an intuitive, easy to use plan. Attract, engage, motivate and retain clients! All-in digital (social, email, web content) content management from $1500 per month. Coaching/consulting $250 per session. 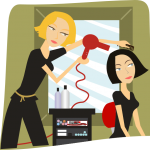 Get the imagery you need to promote your salon, show off your skills or enter industry competitions. We make small businesses look big! Get the tools and training you need to put your brand’s best foot forward.